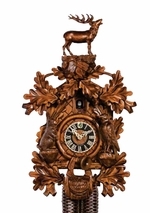 German Cuckoo Clock - Huge Selection+ Free Shipping! 8-day cuckoo clocks have the same internal mechanism, but the weight system is slightly different. This requires winding the clock up every 8 days. 8-Day Musical Cuckoo Clocks You've probably already guessed that the 8-day musical cuckoo clock also needs to be wound every 8 days with the addition of playing musical tunes each half hour and hour. These musical clocks usually play 2 or 3 songs.